(b) From the interior, insert piano wires between the vehicle body and glass, as shown in the illustration. (e) Using a suction cup, remove the glass. (a) Using a scraper, remove the damaged spacers, moulding and adhesive sticking to the glass. 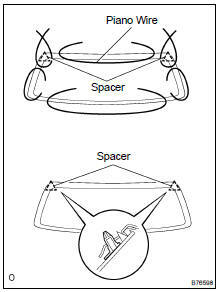 (a) Coat the installation part of the spacers with Primer G.
(b) Install 2 new spacers onto the glass, as shown in the illustration. 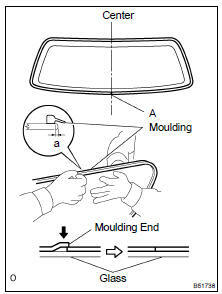 (a) Coat the installation part of the back window moulding outside with Primer G.
(b) Install a new back window moulding outside, as shown in the illustration. HINT: Leave as much of the adhesive on vehicle body as possible. (b) Using a brush, coat the exposed part of the vehicle body with Primer M.
(c) Using a brush or sponge, coat the edge of the glass and the contact surface with Primer G.
(e) Install the back window glass to the vehicle body. 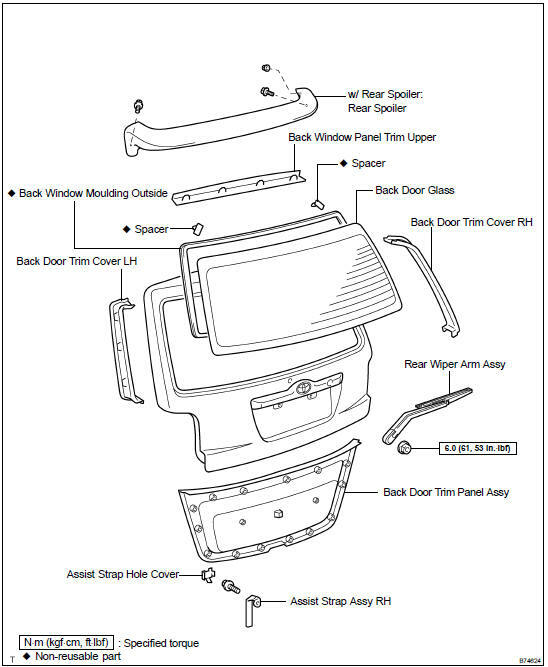 Hold the back window glass in place securely with protective tape or equivalent until the adhesive hardens. Check that the spacers are attached to the vehicle body correctly. Hold the glass in place securely with a protective tape or equivalent until the adhesive hardens.